Wu Jihuai, professor of materials and chemistry and the vice-president of Huaqiao University, gives a presentation on material science to students and lecturers at UoN's College of Biological and Physical Sciences on June 26. According to Wu Jihuai, professor of materials and chemistry and the vice-president of Huaqiao University, through the MoU, the two universities will collaborate on research and students and staff exchange programmes. "We will discuss the MoU in detail where we can, for instance, have students from UoN visit our university and vice versa," he said. 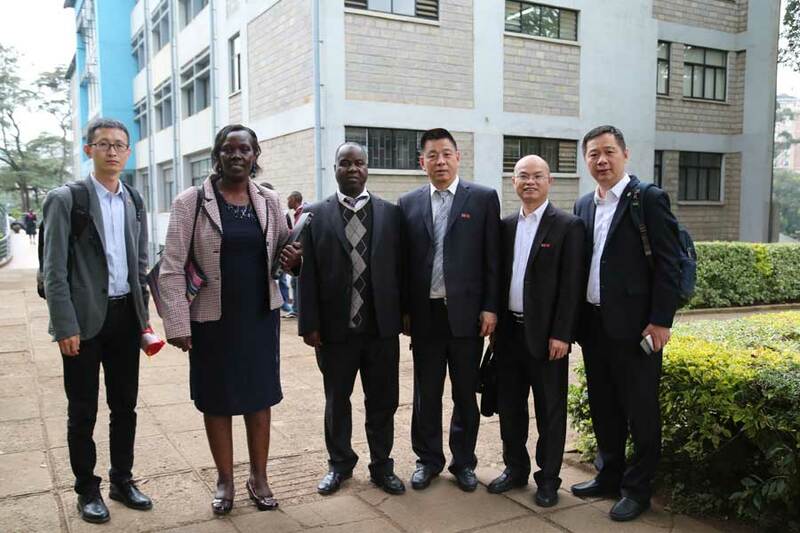 From Left, Liu Hongguang, section chief of office of International Exchange Cooperation, Jane Mogaka, assistant registrar, Alumni Affairs, UoN; Julius Mwakondo, professor of solid state physics, UoN; Wu Jihuai, professor of materials and chemistry and the vice-president of Huaqiao University (HQU); Li Yongquan, the dean, International School, HQU; and Hong Xuehui, the director of admissions, HQU, take a photo at the UoN's College of Biological and Physical Sciences on June 26. 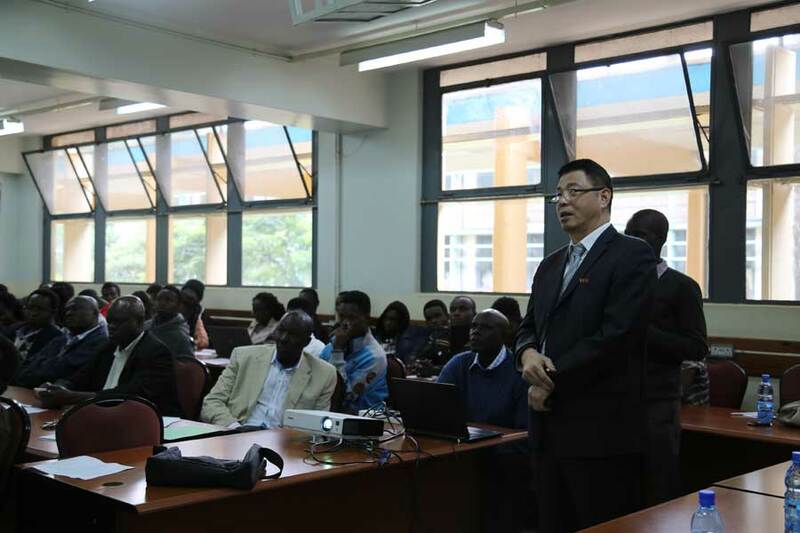 Prof Wu gave the remarks when he visited UoN's College of Biological and Physical Sciences, where he gave a presentation on material science. He specifically talked about research and development on energy, one of the United Nation's sustainable development goals. The UN targets at having access to affordable, reliable and modern energy for all by 2030. Wu took the students and lecturers through the completed research on photovoltaic (PV) cells and recommendations, a topic that greatly thrilled the audience. Wu Jihuai, professor of materials and chemistry and the vice-president of Huaqiao University and Agnes Wausi, director of the UoN's School of Computing and Infomatics, take a photo during a tour by Huaqiao University's delegation to the college on June 26. Christopher Nyamai, dean of UoN's School of Physical Science, said they will invigorate the collaboration with Huaqiao University. He said the future looks brighter as the two universities look forward to collaborating on various fields. Julius Mwakondo, chairman of the department of physics and professor of solid state physics, challenged both students and lecturers to take advantage of the collaboration and identify research areas where they can work with their counterparts from Huaqiao University. 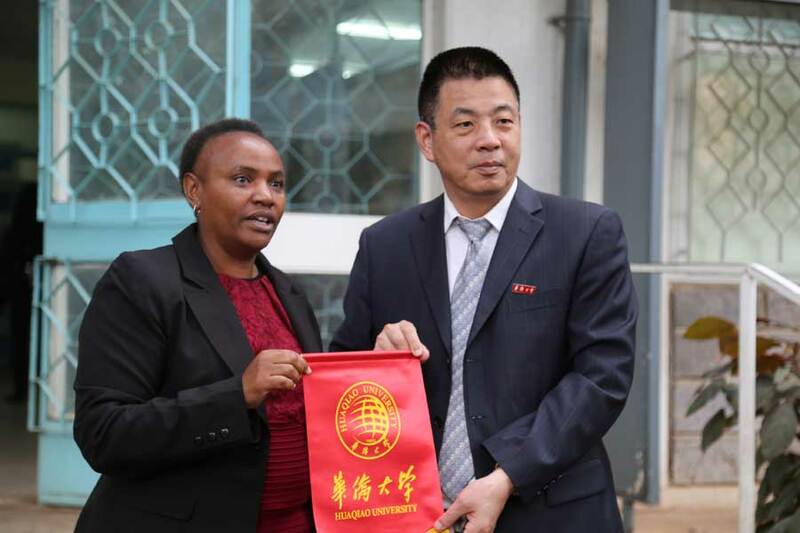 Earlier, Huaqiao University signed a MoU with China Kenya Cultural Education Centre, a school that teaches Chinese language and culture to both children of Chinese nationals residing in Kenya and the local people. It also teaches Kiswahili, the Kenyan national language to Chinese adults. Through the MoU, the centre will recruit Chinese students studying in Kenya to join the university for further studies. Wu was accompanied by three other delegates from the university. They have been in Kenya from June 25 and will be leaving for Mauritius on June 28, where they will visit the Chinese Chamber of Commerce on June 29 to sign admission MoU. They will later visit the Confucius Institute.